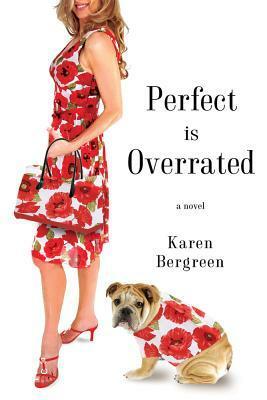 Perfect Is Overrated by Karen Bergreen. Audience/Genre : Adult/Chick Lit, Women's Fiction. Publication : July 17th 2012 by St. Martin's Press. What the best cure for post-partum depression? After years of barely moving, Kate springs back to life when the mothers-youlove- to-hate in her daughter’s preschool begin to turn up dead. Murder as a cure for sadness? Sounds evil, but it’s not. In Perfect Is Overrated, stand-up comedian and author of Following Polly Karen Bergreen presents a lovable heroine who is so at sea she’s still not sure whether what she suffers has to do with the birth of her little girl or with the fact that her handsome hunk of a detective husband doesn’t live with her anymore. She might fall back in love, she might find a killer, but she sure won’t be spending all day in bed anymore. I've been a huge fan of Karen's writing since I read her debut novel Following Polly. I've literally been counting the days until I was able to get my hands on this book and now that I've read it, I'm both, content and disappointed at the same time. Kate is a mom, an ex-wife and a lawyer suffering from depression. The story begins with Kate hearing about the death of Beverly Hastings, a snotty woman whom Kate had once met with regarding her daughter's admission into a fancy, private pre-school. That meeting did not go well. Kate has pretty much despised Beverly since then but for some reason, hearing about her death leads to Kate waking up from her depression and trying to solve the string of murders that's happening. After reading Following Polly, it's kind of obvious that I'd end up comparing the two because I had my expectations set and let me tell you, they were high. Karen Bergreen's writing is just as entertaining in this one and she doesn't disappoint with the protagonist as Kate is certainly a unique and strangely likable character; her quirkiness fascinated me. However, Perfect is Overrated lacks the charm as well as the humor of Following Polly. I'm not saying that it's not amusing or that it doesn't hold your interest because it definitely is/does all those things but it's very different from what I expected. While I still enjoyed reading this book for the sheer writing alone (which is delightful), the storyline just doesn't keep you glued to the pages. If you've not read Following Polly, you'd probably love this because really, Karen's awesome with her words. Kate's sarcasm will keep you entertained through out the novel so yeah, pick this up because Karen's one of the best writers around in the women's fiction genre as far as I'm concerned. If you, like me, have read Following Polly, I've warned you ahead, don't expect the same thing. I can appreciate it all the same because as I said, I'm a fan of Karen's writing style. Although Kate's voice is completely different from Polly's and the story doesn't go the same way, Perfect is Overrated is definitely still worth reading.